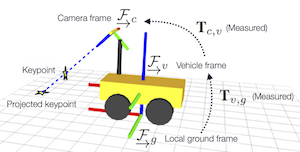 As robotics enters the “robust perception age”, a major focus of modern robotics research will be the design of perception systems capable of operating over extended periods of time in a broad range of environments. Visual perception in particular holds great promise in this area due to the wealth of information available from standard colour cameras. Indeed, we humans rely heavily on vision for navigating our daily lives. But how can we use vision to build persistent maps and localize against them when the appearance of the world is always changing? 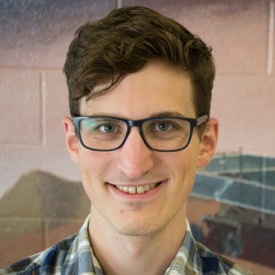 Lee’s research focuses on developing ways for robots to reason about more than just the geometry of their environment by incorporating information about illumination and appearance into the mapping and localization problem. In particular, he is interested in using machine learning algorithms to create robust data-driven models of visual appearance, and using these models as an enabler of long-term visual navigation. 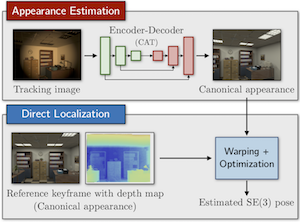 CAT-Net learns to transform images to correspond to a previously-seen reference appearance. IEEE RA-L and ICRA 2018. Brisbane, Australia. 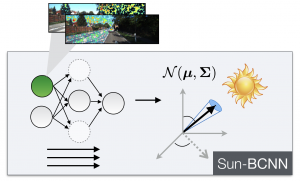 Sun-BCNN regresses the 3D direction of the sun to improve stereo VO. MonoVT&R is capable of retracing human-taught routes with centimetre accuracy using only a monocular camera.